My daughters were minus 2, 2 and 4 years old when I built this playhouse for them, in 1989. Madeleine, my youngest, still used it when she was a teenager. Now some neighbor kids play in it from time to time, and a few weeks ago, they took it upon themselves to repaint the interior, without my permission. So now there are rules! 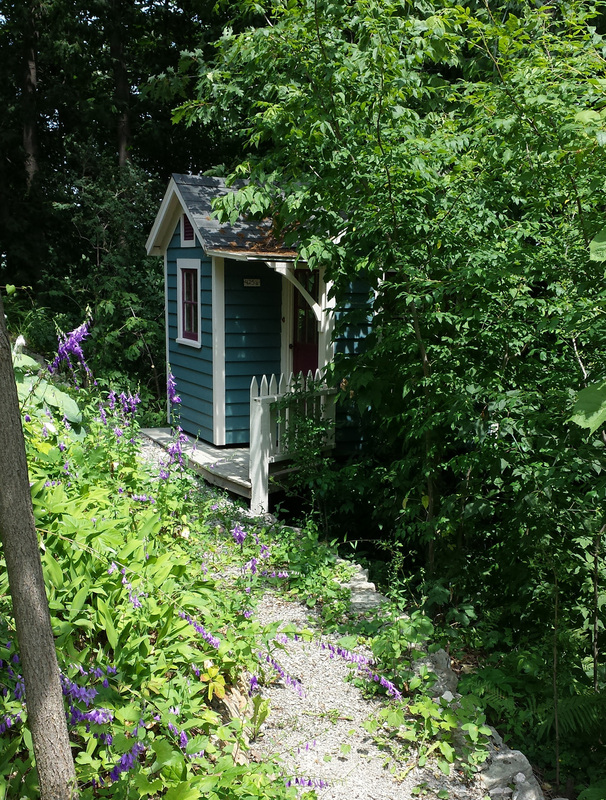 Four girls got together and built an impressive fort one summer in the woods near their home. When I was young, we had the BEST fort! 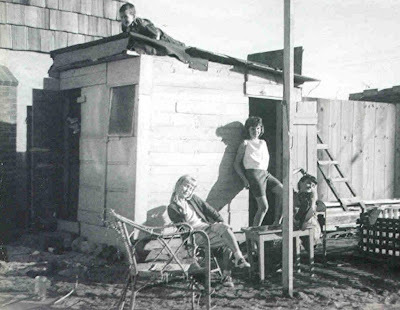 It was a great place that my sister and friends and I built with our own hands. We salvaged building materials from the woods, and asked for wood scraps from houses being built in the area. We used four trees in the woods for corner posts, and found 2/3 of an old wooden door with hinges. My dad helped by giving us some paneling boards and lending us his hammer and saw and nails. We covered the outside with plastic to keep out the rain. We even made a brick stove inside with a grill that we used to cook sliced lunch meat for lunch. Yum! The smoke went out the window that had only a metal screen. It was an all-girl fort, with a "No Boys Allowed" sign by the door. We were about nine years old then. Then one day, the neighborhood boys launched an attack. While we were all inside, they beat on our fort with sticks, and one boy shot at the fort with a b-b gun. A b-b went through the thin wall and hit me on the foot. Wow, did that sting! Well, my friend Karen ran home to get her older brother, Barry, who came and rescued us. He carried me home on his shoulders because I made such a fuss over my tiny flesh wound. Barry was about fifteen. I think that was the first time I fell in love, he was so big and strong. All the dads then came and disassembled our fort because things got out of hand, and we thought that was really unfair. We also used our fort for animal rescue, at least we thought we were doing animal rescue. For a while, we kept some baby birds, snakes, salamanders and a few bull frogs. It was the best summer of my life while it lasted! 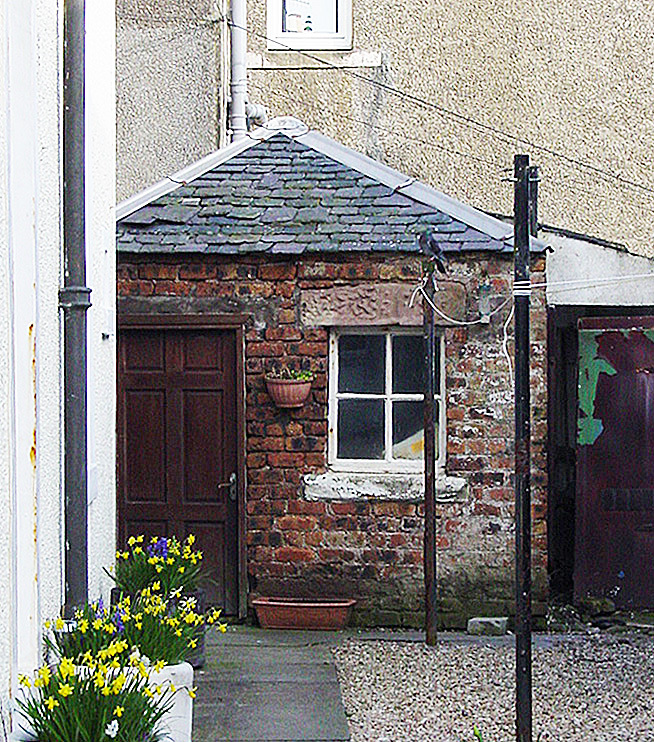 My backyard studio started out as a chicken coop. 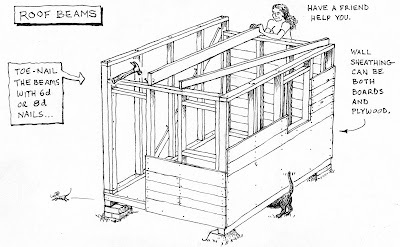 After an unfortunate incident involving coyotes, we no longer needed the chicken coop, so it became a storage shed – mostly gardening stuff and my husband’s carpentry tools. 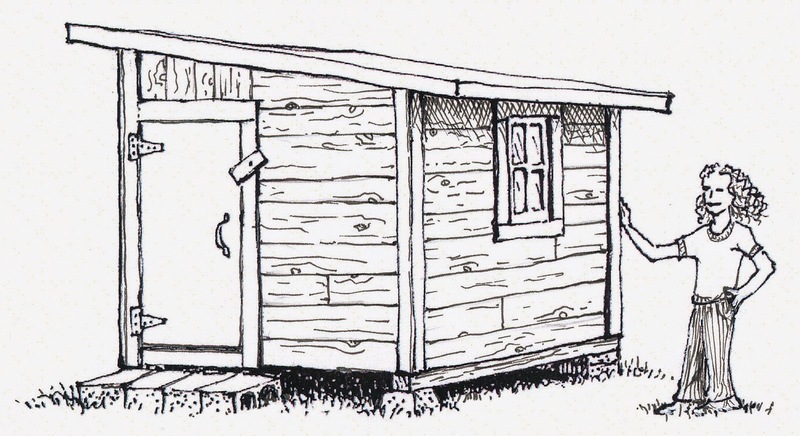 We built the original coop-shed with new lumber for the framing, but we used field stones for the foundation, and miscellaneous wood, roofing, windows and a door we had in our barn! My Husband, Juano, a carpenter, helped me make sure the floor and frame were level and square, using the 3-4-5 rule*. When he was too busy to work with me, it was great to have my copy of Keep Out! as a reference so I could work on it when I wanted to. While he did a lot of the work, I felt, by using the steps in the book, I could build the frame on my own! I learned a ton from both his kind, patient explanations and from the book. 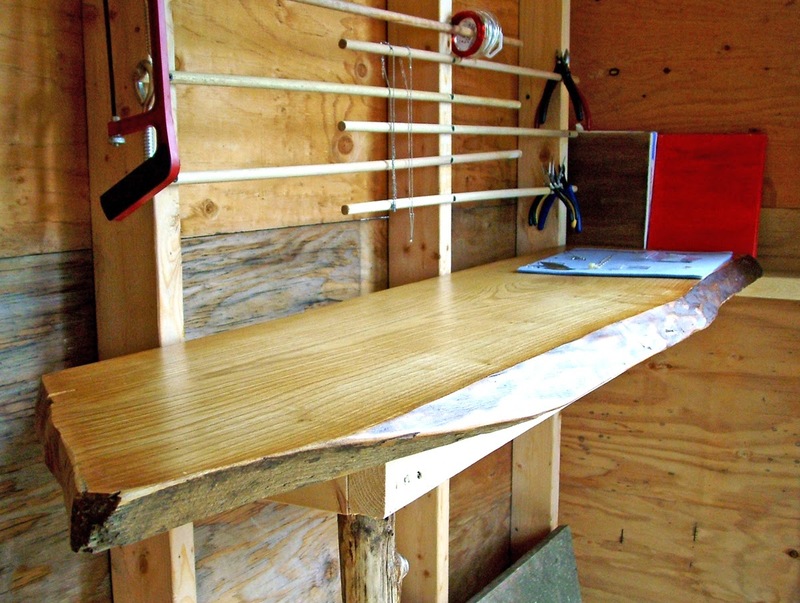 Later, I cleared out the shed and made it into a studio with more "shopping trips" from the barn for an old drafting stool, a table and some beautiful barn wood. I get Juano's advice, but I am not afraid to make mistakes, either. So thank you for the "you-can-do-it!" 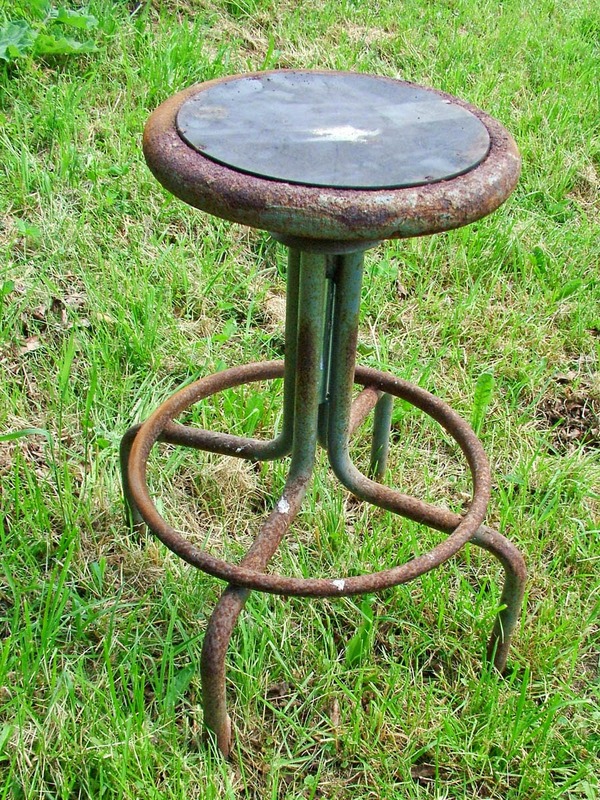 inspiration in Keep Out! My new crafting bench from a 2" thick piece of hardwood I varnished. 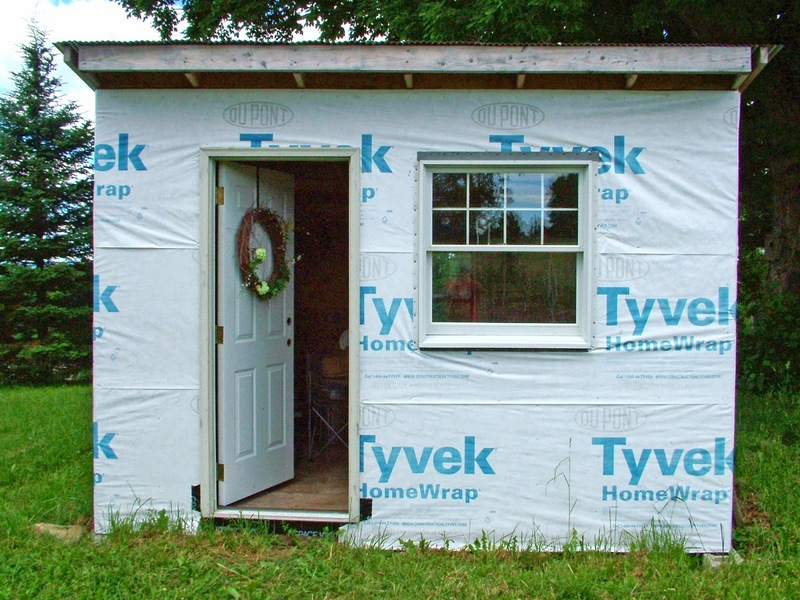 The Tyvek has been the siding for a couple of years; it adds character! And, as we say in the hilltowns: if you finish your house, then it's time to move. 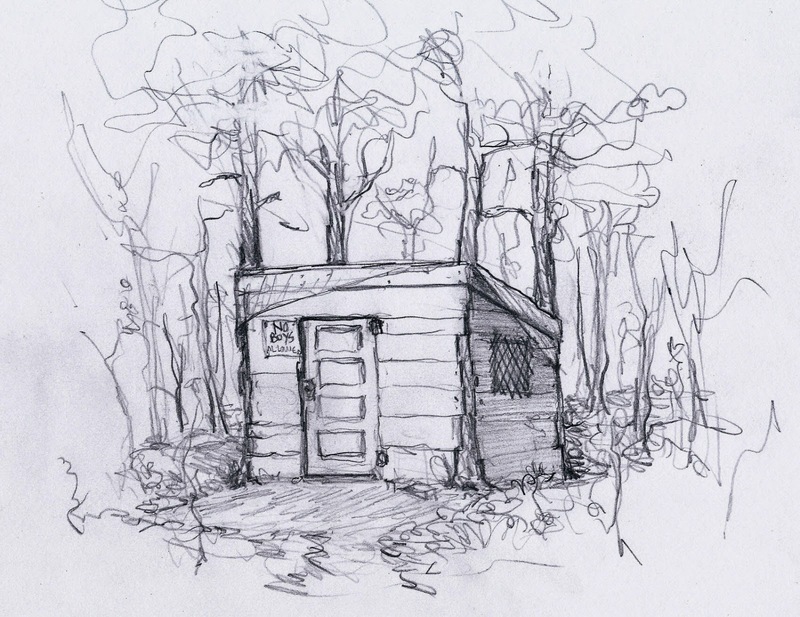 Our next venture: my 11-year-old daughter is making her very own cabin! Keep Out! wasn't far from her side while she drew plans over the winter. She has already consulted her dad about building 6" thick walls, inspired by an adobe home she saw on a trip to New Mexico last fall. Kids need a place that they can call their own. It can be a backyard shelter, no matter how crudely built, where a couple of friends can sit in and talk, or read comic books, or (nowadays) play games and text on their phones. If your kids (girls too!) have a desire to build some kind of fort or hideout, by all means let them. Ideally, the less you help them, the better…let them discover the process themselves. 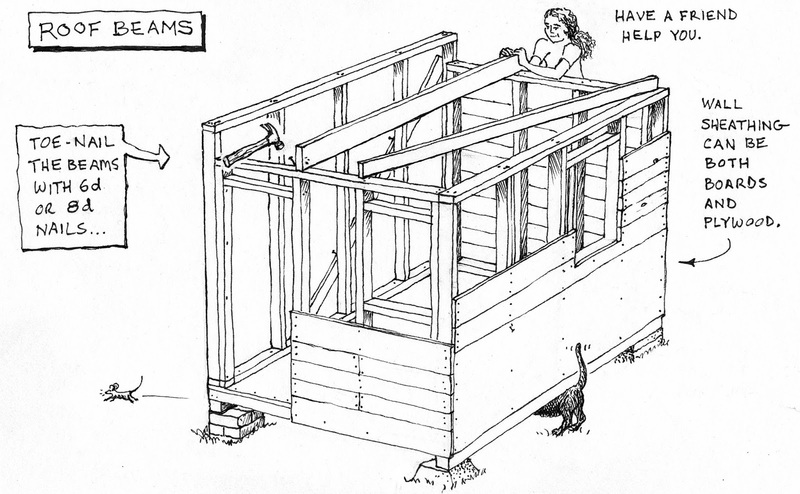 Your task could be to provide a few tools, nails, and help transporting lumber, either used or new. Kids are surprisingly resilient; they won’t kill themselves or each other by building a clubhouse, and they will be doing something creative that will give them a deep sense of pride. Also, they won’t be crying that they’re bored, and you’ll know where they are! Kids need their own community, and a special place to experience it. A clubhouse, especially one they built themselves, gives kids a sense of privacy and independence, a safe place to talk, socialize, or decide whether to paint the place. They learn about consensus, and find that its fun to plan a bike trip or a cookout together. It's much more rewarding than sitting alone in front of the tube, or even sitting alone and texting. Hanging out with a bigger group is a far richer experience. This is the kind of community that emerged when our random group of kids decided to build a clubhouse. Somehow the idea of building the thing together cemented us more as a group; we had a common project that everyone could contribute to. One kid provided the backyard (no easy task), another had found some good wood, another could pound nails pretty good, and even the youngest kid with no building skills had a knack for finding the coolest clubhouse-furnishings in the trash. We spent Saturdays and after-school hours at our clubhouse for a couple of years, tearing it apart and fixing it up continuously. It was an adventure! I wrote Keep Out! 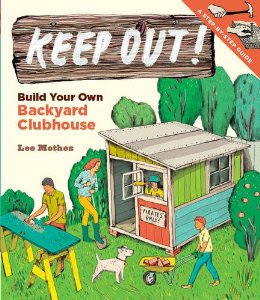 Build Your Own Backyard Clubhouse to inspire kids and supportive grownups to get together and build a place of their own in which to gather, socialize, be a community! If you're trying to build your clubhouse but don't know what to do next, either as you are starting out or at some point in the middle, let me know. You can comment to this post with a question, or e-mail me at mothesart@gmail.com. I'll help you if I can! 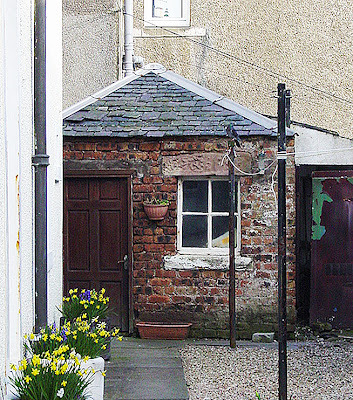 While on a trip in Scotland two years ago, I spotted this slate-roofed shelter in someone's back yard. It was about 8 feet by 8 feet in size, and looked quite old.